Yesterday morning, Tammi and I put our time where our mouths are and volunteered at the first market of the season of the Malcolm X Blvd. 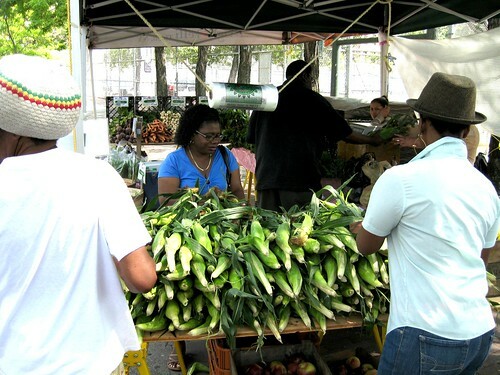 Community Farmers Market here in Bed-Stuy. My initial fears of just about anything done in the neighborhood is that it’ll be half-assed. I’ve seen it over and over, people have big ideas but nothing to back it up. But my worries were unfounded. 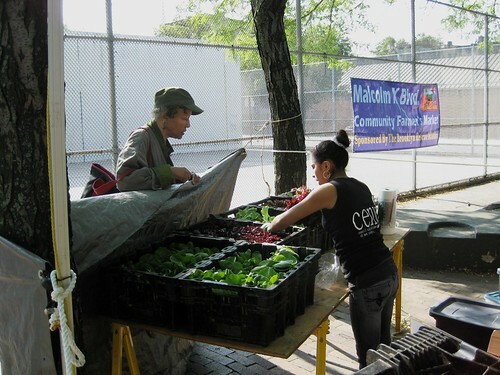 While a little disorganized, the market brought a great turnout of volunteers and what I hope is just the beginning of neighborhood denizens taking advantage of the only farm fresh fruits and vegetables on offer for miles. The Reverends Jackson, who run this farmers market as a part of the Brooklyn Rescue Mission (more on that later) have managed to bring in some farmers from the Greenmarket circuit this year. Yesterday, folks from Migliorelli Farm offered some great vegetables, including baby fennel, bok choy, various braising greens, Japanese turnips and good selection of fresh fruits. Later in the morning, there was a cooking demo where this woman, who I didn’t get to meet showed folks how to prepare many of the ingredients on hand. Another farmer supplied 100 lbs of organic beans to the mission to repackage and sell per pound. Tammi, along with some other volunteers and summer youth workers divvied them out into one pound packs. When I saw the rich, deep colors of the black and the dark red beans, I had to buy some for myself. In fact, I had to run back home to get a bag to haul back all the veggies that I bought. Next week more farmers tables will be up as well as someone selling fresh baked bread and artisanal honey, among other things. If I’m gushing here, it’s because I’m very excited to have something like this in the neighborhood. I’ve lived in Bed-Stuy for a long time and there has been a dearth of markets offering anything fresh for the last decade. It’s about half a mile from my house to any place offering any vegetables that aren’t shriveled and moldy. Having this mere blocks away will alter the quality of life in this area for tons of us who have been trekking to Fort Greene or Park Slope or Union Square to get food that has been well cared for. I’m going to be out of town for a fair portion of the rest of the summer weekends, so I want to do my part to make the market a success by spreading the word as much as I can. I hope to post regularly about which sellers will be coming in and what food will be available. Saturdays, 8am – 1pm through the summer. 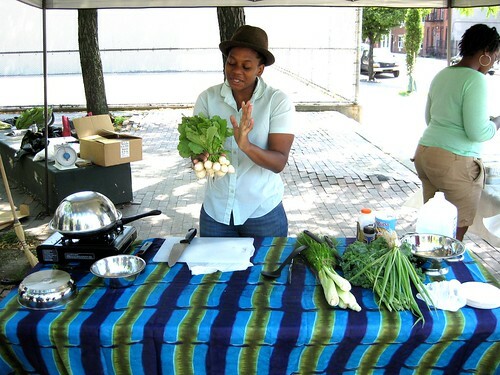 The woman pictured above doing the cooking demo is T. I. Williams of livesip.